Vincent Price was considered one of horror’s greatest actors. With a career lasting almost sixty years (1935-1993), Vincent Price became an American icon. In the seventies, long after success in the fifties (House on Haunted Hill, The Tingler, and House of Wax); yet predating true mainstream iconographic glory in the eighties (Tim Burton’s Vincent and his voice in Thriller), there was his dynamic role in two British films. The role was of Dr. Anton Phibes, lead of 1971’s The Abominable Dr. Phibes, and 1972’s Dr. Phibes Rises Again!. This clay faced, theatrical loving, gramophone communicating mastermind strikes fear into the hearts of men. Since Dr. Phibes Rises Again! deserves its own look, tonight I will only focus on the original. Both films in the Dr. Phibes series were headed by Thriller director and screenwriter, Robert Fuest. Fuest’s other works include The Final Programme (known in the U.S. as The Last Days of Man on Earth), his critically successful And Soon the Darkness, and the “cult” film The Devil’s Rain (reading William Shatner’s biography gave me some hilarious insight into this Anton LaVey associated train wreck), as well as directing Dr. Phibes Rises Again!. The Abominable Dr. Phibes takes place sometime during the 1920’s in England. In the first shoot we see an art-deco yellow and purple party room, where a cloaked Dr. Phibes playing Felix Mendelssohn’s War March of The Priest on a neon red organ whilst the credits role. After finishing, Dr. Phibes approaches a collection of life sized wind-up toys, affectionately called Dr. Phibes’ Clockwork Wizards, turns them on with a hand crank, and starts to conduct their playing. 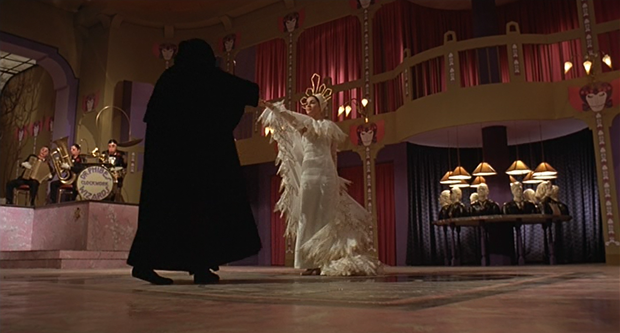 Then a woman (credited as Vulnavia) in an elaborate white dress appears; she starts to dance with Dr. Phibes, until stopping to walk up one of the room’s raised ledges. The film then cuts to both Dr. Phibes and perpetually silent Vulnavia, who we understand now is his assistant, who drive off in an old-fashion automobile with a cloth covered cage. They are then shown opening the ceiling window of a man’s bedroom, letting the contents of the cage fill the area while a sleeping man lies in bed. After they have left, the man wakes up to see shooting shadows cross his vision. Terrified, he soon discovers that his room has been infiltrated with bats. The bats attack him and all that is heard is his scream. The next day arrives, and Detective Trout (Peter Jeffery) is investigating the death of the sleeping man. He finds out that he was a doctor, and from what his partner tells him, has died in a similar fashion to another local doctor who was killed by bee stings. Detective Trout believes that these two cases are connected. So this part of the movie follows Trout’s job to find the killer. Sometime after another doctor is killed in a similarly weird fashion, death by frog shaped head mask that crushed his head. He meets with Dr. Vesalius (Joseph Cotton) and the two throughout the movie discover that these deaths relate back to one man. 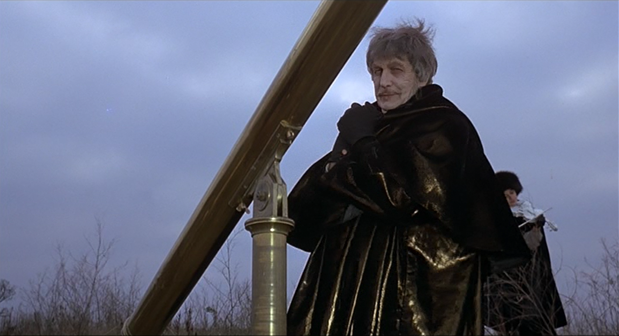 The long dead musician, Dr. Anton Phibes, who died while sporadically driving back to aid his dying wife. He is murdering the nine individuals who tried to save his wife from beyond the grave. He considers these doctors murderers and is killing them off one by one, each death correlating to one of the plagues set upon Egypt in the Old Testament. Now the only question is will Detective Trout and Dr. Vesalius be able to stop him? The Abominable Dr. Phibes has excellent design work in both sets and costume. Dr. Phibes’ headquarters is one part evil lair and one part shrine to his wife. Things like a show of busts representing the doctors he still has yet to kill, two fake trees with stuffed owls that line his organ, and all of those red velvet curtains the cover every door and window. Dr. Vesalius’ apartment is also something to look at. With a more seventies open space look, with a hair solon like walkway with lined chairs, and a ton of randomly placed statues. 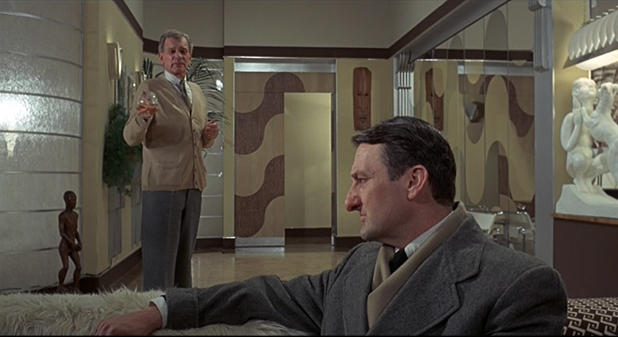 Costume wise, Dr. Phibes constantly switches between white robes to 20’s gentleman attire like it was nothing. Vulnavia displays different dresses frequently, but always seems to go back to this casual outfit that reminds me of the way Siouxsie Sioux looked in the video for The Passenger. I would consider this film’s soundtrack to be just as important as its art design. From the operatic pieces that Dr. Phibes and his Clockwork Wizards play, to the soundtrack by ambient master Basil Kirchen, The Abominable Dr. Phibes impresses. This films’ influence on other artists is also something to bring up. Bands like The Misfits and The Damned have songs that reference Dr.Phibes himself. Not to mention Dr. Phibes & And The House of Wax Equations. Pros: The unique design and music give the movie its own distinct style, something that I consider to be one of the most important parts of any creative work. The acting is great, it is enjoyable to route for Joseph Cotton and Detective Trout is strong enough to hold his own. This movie pulls off dark humor and a little British humor unexpectedly during the second half, but most of it is warranted and pretty funny. 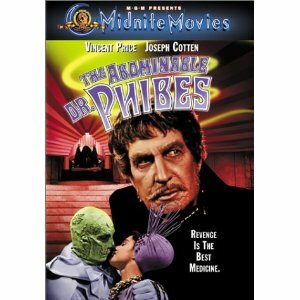 Cons: Without revealing plot points, some of Dr. Phibes actions seem to contradict things that he has done in the past. They downright break the films’ rhythm and are distracting. Some of the attempts at humor hamper scenes that would have been very serious otherwise. While I do enjoy the acting in this movie, many of the victims seemed to overreact to the way they were being killed. Making certain scenes play out goofy and forced. The release I own is an MGM Midnite Movies’ line double pack, so The Abominable Dr. Phibes and Dr. Phibes Rises Again! is on the same disc. I suggest this release because I believe that the sequel follows tightly after the original to the point that I started to watch it right after I finished watching the original. There is also another MGM release called the MGM Scream Legends Collection that included both films. Excluding a few inconsistencies, The Abominable Dr. Phibes has become one of my favorite films; I suggest checking it out.